Covered pool, gourmet kitchen, large home! Hello, I am 661 Stanley in Brawley. The covered and sparkling beautiful pool is ready for your family to fight the scorching summer. 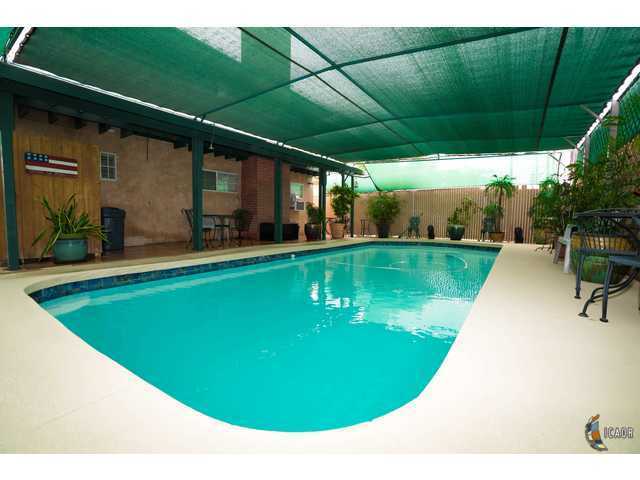 My pool is very clean and covered from most sides for your privacy and protection from sun. Pool side shower and restroom are added bonus. I have gone through extensive and expensive upgrades. The cook in your family will definitely enjoy the gourmet kitchen with 5 burners stainless steel stove, nice hood, high quality cabinets and counter top, plenty of cabinets with some of them have glass to display beautiful chinaware, dining area, and walk-in pantry. I have 4 specious bedrooms, 2 family rooms, 3 fireplaces. Downstairs master bedroom with fire place with tall mirror closet is mesmerizing. Upstairs family room with a fireplace is the perfect place to build family memories. Custom built carport with recessed lighting adds beauty to house. I have plenty of space to entertain a large family. Come and see me.